There’s nothing quite like the outdoors. With your boots tied tight and a trusty horse beneath you, come and journey through the forgotten wilderness of South Florida. And that’s just what you’re going to do here at A&A. 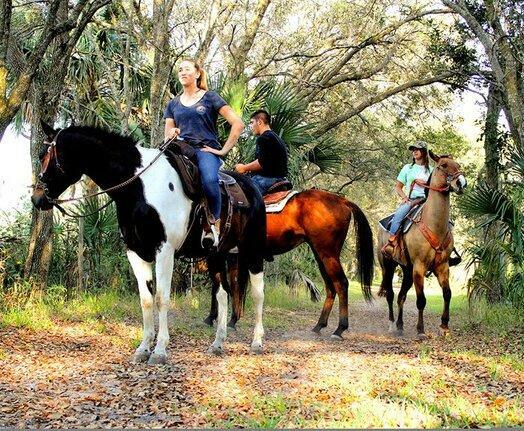 A&A offers enjoyable, fun guided horseback tours for all abilities. Our rides are independent, individually instructed with our specialty in safety and authenticity. Relax your mind and invigorate your spirit with our expertly guided trail rides. At A&A you’ll find great tour packages that even an experienced adventurer would swoon over. We work hard to ensure the health and happiness of our four-legged team. A&A knows that a happy horse aims to please his rider – keeping our horses protected and happy is just another way we seek the happiness of our guest riders. So, saddle up, find your cowboy hat and schedule your tour with A&A today! Whether you’re just visiting the southeast, or being a long time resident, there is fun for everyone when riding with AAA. Escape into a ride through South Florida’s nature from the swampy everglades to trails filled with lush greenery, shady palm and native trees and occasional wildlife viewings. Get out of town and get close to nature. Coming soon – trail rides on the beach! AAA does it all! We providing our guests the full South Florida experience. We take pride in sending home happy guests, and do everything in our power to satisfy all requests. We will pair you with the perfect horse on one of our chosen trails. You will leave AAA with a smile and an unforgettable experience to remember a lifetime.